When the concept of BankMobile began, the team looked at companies outside of the industry that were succeeding using technology while provide an amazing customer service experience. One of those companies is Zappos. So when the team was in Vegas for the Money 2020 conference, we took a detour to tour Zappos to learn about how they built their company culture and core values. The tour began with our culture guides showing us a few videos on the history of Zappos, from their humble beginnings in San Francisco to their expansion and move to Las Vegas. The unique culture of Zappos begins with their core values, which we were able to see in action, first-hand as we toured their facility. Here’s a peek inside one of the most loved brands in the country. When employees are hired, their tie is cut and displayed on this wall to remind them that this is not a suit and tie kinda place. 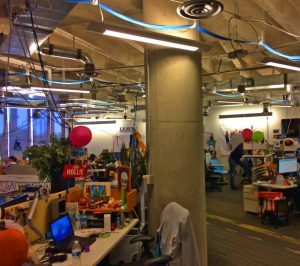 To strive for open communication, Zappos believes in having an open floor plan designed by their employees. To remain creative, a little weird, and have fun, the team uses their office walls as an art gallery where local artists and employees can get in on the fun. At the end of the tour, you’re invited to become a Zappos VIP in the king chair to remember your trip. Here’s the BankMobile team’s photo. The Zappos tour served as great inspiration to embed our core values and mission to deliver a remarkable customer experience that makes people say, “WOW, I finally found an effortless and transparent bank!” Here’s what the Zappos culture is all about, or you can see it in person when you book a Vegas tour.